An Apple A Day Keeps the… Dentist Away? You already know that an apple a day helps keep the doctor away — it’s an adage as old as time. Could the same be true for your oral health? Well, when you consider the fact that apples are naturally hydrating and satisfying enough to maybe keep you from craving that sweet afternoon cookie or cake, we’d say yes! Especially for kiddos, who are at an even higher risk of developing tooth decay. 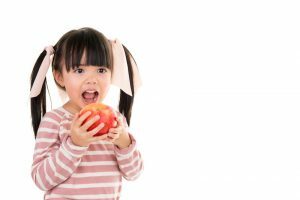 Whether it’s the Pink Lady, Gala, or Red Delicious you prefer, they’re all great for oral health — keep reading to find out more about the magic in apples. The next time you’re feeling that mid-afternoon sluggishness, skip the coffee and reach for an apple instead. You may be surprised at the natural boost of energy it provides you with — and you will probably notice your breath feels considerably fresher, too. What’s to thank for that freshening power of the fresh apple and other raw fruits and vegetables like it? It’s all in the crunch. Apples naturally scrub the plaque and bacteria that causes bad breath from the surface of your teeth. So even if you don’t brush your teeth after every single meal, eating a fresh apple can have a similar cleansing effect. And it’s not just the natural scrubbing power of apples that makes them a positive for your oral health. Eating a crunchy apple also stimulates saliva flow, which helps to wash away the acids and sugars that cause tooth decay and gum disease. Drinking water throughout the day and rinsing your mouth out after eating sugary snacks and candy will help your mouth stay even more hydrated. Wait — You Don’t Like Apples? What’s that? You’re not much of an apple fan? Don’t worry — it’s not only the Pink Ladies that will help keep your smile healthy. If you just can’t do apples, try reaching for fresh carrots, celery, or even a handful of nuts to get a similar “scrubbing” effect. Eating healthful fruits and vegetables as part of a balanced diet and practicing good oral hygiene habits can certainly help you avoid the need for complex dental care, but no matter how healthy you are, make sure you still attend regular checkups and cleanings with your dentist! These preventive visits are crucial for the early detection and swift treatment of issues like cavities, gum disease, malfunctioning dental work, and other oral health hazards. Toss in an apple a day and you’ll enjoy a lifetime of happy, beautiful smiles! Dr. Susan Kutis provides superior comprehensive dental care for Littleton friends and families. A graduate of the University of Illinois at Chicago School of Dentistry, Dr. Kutis completed a general practice residency at the University of Colorado and stays engaged in the field through a number of professional organizations and continuing education opportunities. To learn more about how to keep your smile healthy and clean between visits to the dentist, please contact us at (303) 973-1112. Comments Off on An Apple A Day Keeps the… Dentist Away?